The Award Winnng NTA band program is under the direction of Mr. John Wright. Band is offered to students from 5-12th grades. Our band director, Mr. John Wright, has been teaching since 1988. He taught for four years in the NC public school system. In 1992 he started the Northwood Band Program, along with his wife Janet. He has a bachelor’s and master’s degree in music education from East Carolina University and is a member of the North Carolina Bandmaster’s Association. He has continuously served as a praise and worship leader in several different churches since 1985. He served as the Northwood Temple Orchestra Director for 18 years as well as lead the Crosswalk Youth worship team. Since 2014 he has served as the minister of music at Lebanon Baptist Church in Eastover, NC. Mr. and Mrs. Wright have one son, Nathan, who is the instrumental music director of the RDU Elevation Church site in Raleigh, NC. In the 5th grade, students have the opportunity to take band every day. Mr. Wright starts from the very beginning with instrument assembly, hand position, embouchure formation (how you hold your mouth), posture, tone production and reading music notation. In their first year, they play for the elementary chapel three times, perform a Christmas Concert and a Spring Concert. 6th and 7th Grade students who have completed the 5th grade band are eligible to join the middle school band. Interested students also help Mr. Wright with the praise and worship music for middle school chapel. This band plays about two times a year for the middle school chapel. They perform a Christmas Concert, a Spring Concert and also travel to the NC band festival and the ACSI band festival. They also play for the high school graduation every year. This past year, the middle school band received an Excellent rating at the NC Band Festival and a Superior rating at the ACSI Band Festival. Middle school band students also participate in the All-District and All-State band clinics. 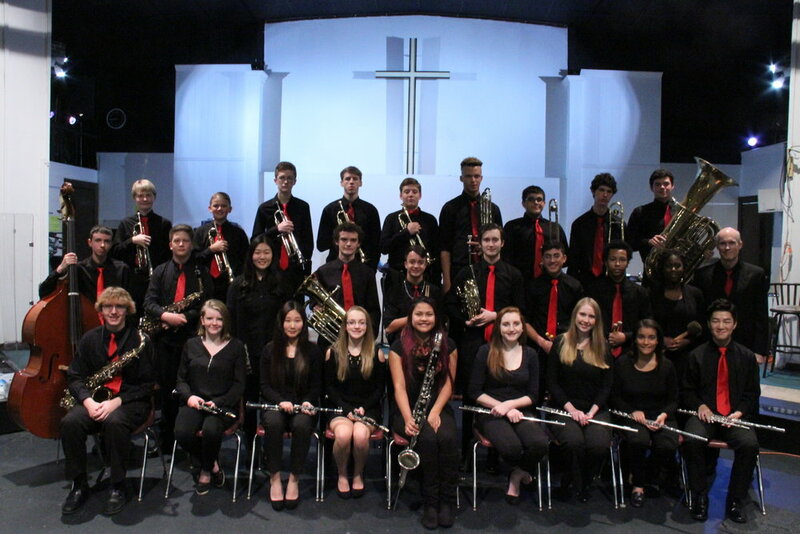 8th – 12th Grade band students perform a great deal throughout the year. Performances this year: Veteran’s Patriotic Celebration, Cape Fear Botanical Garden Performance, Christmas Concert, Chapel Performances, Spring Concert, NC Band Festival (Excellent Rating) and the ACSI Band Festival. (Superior Rating) High School students participate in the All-District and All-State band clinics. 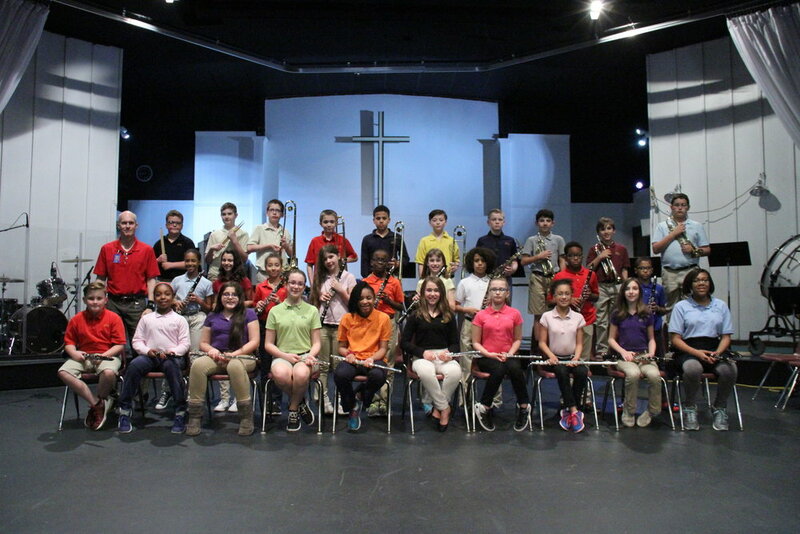 Each spring, Mr. Wright writes a musical drama that they perform for the school and for parents. At the Spring Concert, Mr. Wright gives a plaque to graduating seniors and writes several paragraphs about each of them. Students who do really well in dramatic roles also receive an “Oscar” for their outstanding performance. Mr. Wright’s “Oscar” is a framed picture of “Oscar the Grouch” in his trash can with their name at the bottom.